The family arrived yesterday to attend my convocation (later this afternoon). When my mother showed up, she brought me a parcel that I've been eagerly anticipating. It's the prize Nicole sent me from her Birthday Blog Bash, and can I just say yum, yum, yum! I am in love with those stitch markers! They are delicate and beautiful. The yarn is KnitPicks sock yarn in a colourway called Cape Cod. It's so smooshy and colours are lovely together, I can't help but bury my face in it every now and then. The other half agrees since he's already decided that the yarn is destined to become "socks he can wear to work". Thank you Nicole, I am touched by your generosity. 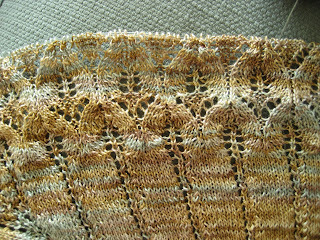 In other knitting news, these last few days have also seen the end of Chart 3 on the Icarus front. The calculator says that I'm 77.7% of the way through this beast. The rows are starting to drag a little so it will likely be a few more weeks until this beauty comes off the needles. On the (neglected) spinning front, the wheel and I have made up after a long hiatus. This is the (almost-full) first of two bobbins of singles. I can't decide if I should ply this bobbin now or spin up the second bobbin of singles first. I'm really excited to see the end result, but am also afraid that I won't be able to keep things consistent if I stop now. Lucy is also progressing. Part of me is starting to worry that I'll run out of yarn since my row gauge is slightly off. To compensate, I've irrationally starting knitting one of the sleeves to get a better sense of how much yarn those will eat up. Posted by Amanda at 9:42 a.m. Your Icarus looks wonderful! I would never have thought of using a calculator to figure out my progress...LOL. 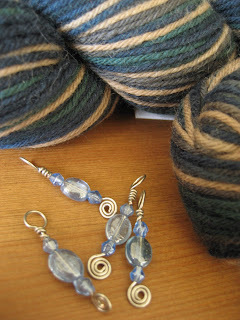 The stitch markers are lovely - I have a nice collection myself and then end up using the little round black ones! 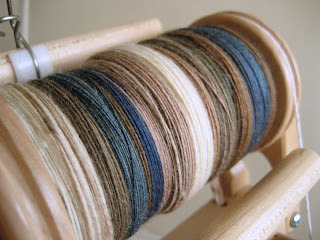 Your spinning is looking lovely as well; you have been pretty busy! June 17, 2007 at 1:15 p.m.
Those singles look so calm and restful--and even :) Nice work! June 17, 2007 at 4:58 p.m. I've just bought Handmaiden Silk lace - how do you find it? I've also bought Victorian Lace Today [still waiting for delivery] but hoping there will be a pattern to do justice to this stunning yarn! June 19, 2007 at 7:15 a.m.
June 19, 2007 at 2:10 p.m.